Underwater vehicle operators have to make a choice when deciding on a sonar imaging system to integrate on their systems. The decision could result in a trade-off, with a choice to be made between achieving high levels of range and resolution, and power and weight budgets. The decision made can impact the value of the subsea survey, classifying and mapping operations. But does it always have to be a trade-off? What is a Multiple Aperture Sonar? In multi-aperture sonar (MAS), the dynamically focused multibeam input from 32 elements is used to extend the focus along the whole swath. Multiple apertures further enhance the data and improve the signal-to-noise ratio. MAS sees further and at a higher resolution than traditional side-scan sonar. However, compared to synthetic aperture sonar (SAS), it has a shorter range and offers less resolution, which poses the question, when should we use MAS? Most commercial autonomous underwater vehicles (AUVs) are being used to survey the seafloor. This is due to the ability of AUVs to provide a stable sensor platform as well as being able to move along a predetermined set of waypoints. AUVs outperform all other platforms; they can survey for prolonged periods of time, at a set distance from the seafloor and sample at near constant speed. Since the value of the AUV is determined by its ability to survey, their value increases with improved sensing technology. SAS systems have become the sensor of choice for many commercial systems. They operate at a lower frequency than their side-scan counterparts. This means they can operate over longer ranges with often 400m swaths. By synthesising a longer array, SAS also provides very high-precision data approximately 5cm x 5cm across the whole swath. The problem with SAS is its space, weight and power (SWAP) requirements - SAS arrays are heavy and big. They need 100 Watts to operate. This means that their use has been limited to large AUVs, which can carry more batteries, heavier loads and bigger instruments. The problem with these larger AUVs is that they also need larger vessels and crews to operate them, which means higher operating costs. In MAS, targets can be clearly detected even at extreme ranges. Offering reduced operational costs, man-portable AUVs can be operated from smaller vessels or vessels of opportunity. They are also quick to mobilise. However, their SWAP budget is severely restricted compared to their larger counterparts. For small AUVs, compromises need to be made when choosing payloads. It is not just the sonar payload. The AUV will also require instruments to navigate and communicate, which place an additional burden on the SWAP budget. On these systems, SAS is not an option; they are too large, too heavy and too power hungry. Traditional side-scan sonar systems have been the instrument of choice for smaller AUVs. Their power requirements are close to 20 Watts - they are small and light. This comes at the expense of performance. At 150m swath, it is not just the limited range, it is also the limited 0.3° along-track beam resolution of the latest generation systems. There is a big gap between side-scan sonar and SAS. This has limited the use of small, man-portable AUVs to very shallow waters where larger AUVs cannot be easily launched or recovered. MAS systems can close that gap. MAS systems excel when mounted on AUVs. By equipping a MAS on an AUV, operators increase the range and precision of the AUV. MAS technology can be designed to operate with a very restrictive SWAP budget. It can operate with the same power required to operate side-can sonar systems. This makes MAS ideal for rapid, low-logistics, long endurance, high-resolution deployments of AUVs. The additional benefit is that MAS offers longer ranges at a higher resolution. The resolution is comparable to SAS near the nadir and is at least two times better than side-scan along the whole swath. MAS systems improve the data of the AUV. Solstice from Sonardyne is a MAS system designed to suppress multi-path effects and improve the highlight and shadow contrast of generated images. Solstice uses a real-time technique to dynamically re-calibrate each individual hydrophone element several times a second to compensate for any dynamical strains. The overall process generates narrow (0.15°) along-track beams and provides 200m swath. Solstice only draws a maximum 21 watts (including the data-acquisition processing). The precision of the sonar over the initial 50m swath is comparable to SAS systems. At the 75m range the precision is better than two times that of the closest side-scan sonar and unlike those competitors, Solstice can provide data over a 200m swath. For a sonar that offers interferometry, in other words 3D images and motion compensation, it is small and light, making it ideally suited for a two-person portable threshold. This is evident by results obtained in recent trials. 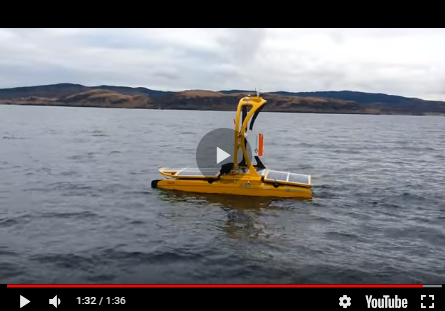 Solstice was mounted on a Bluefin-9 AUV and used to find lobster pots measuring approximately 800mm long, 600mm wide and 400mm wide at different ranges. The lobster pots were at different ranges from the sonar and the results demonstrated that Solstice could be used to find lobster pots even at a 92m range. The results validate the value of MAS. Like SAS data, Solstice data is displayed in tiles, but it is a well-understood format and leading software companies can import the data. AUVs have transformed the way side-scan sonar surveys are carried out. Many of the world’s navies have incorporated AUVs into their operations. Used to survey, classify and map, AUVs can be deployed in challenging littoral waters and obtain actionable results. The sonar images they gather help operators make better decisions, which in turn help them save time and better manage risk. Improving the value of the data gathered by the AUV ultimately serves to increase the value of the AUV itself. A simple statistic used to define this value is the area coverage rate (ACR). The ACR is defined as the area in metres squared that is surveyed every hour. A larger ACR means more value. However, ACR needs to be determined by the resolution required from that survey. For instance, if the purpose of the survey is to find lobster pots, the ACR of any system will be limited to areas in which the lobster pots are observable. For instance, a low frequency, low-resolution sonar may have a large operational range; if it cannot observe the lobster pot, its effective ACR will be 0m2/hr. MAS therefore offers substantially more value. A larger ACR increases the efficiency of the operation as the AUV gathers more data in less time at the required resolution. Better resolution also benefits the tempo of the operations. It is common for the output of an AUV operation to be used to input into a wider scope of work. Navies may map the location of objects that need to be inspected in closer detail. Oil companies may use the data to draw an inspection schedule for a subsea asset. The data may be analysed by a human operator or computer-aided detection and classification algorithms (CAD/CAC) to automatically analyse it. Regardless of the analysis technique, every miss-identification will require increased deployments for divers, AUVs or perhaps remotely operated vehicles (ROVs). That will add time to the scopes of work. Thus, better imagery has a wider impact than just ACR rates. The new Bluefin-9 equipped with Solstice from Sonardyne. Leading suppliers of AUVs have integrated MAS across many different size platforms. In 2014, an initial case study saw Solstice integrated on a Bluefin-12 used to inspect a pipeline end manifold. The data from that mission was of such high-quality that it encouraged a number of clients to explore opportunities for MAS in other missions. Solstice has also been integrated into a Double Eagle in support of mine-hunting missions. In 2017, Solstice was integrated on the National Oceanography Centre’s Autosub Long Range and used to survey and find man-made leaks. The system was able to identify various sized leaks across different ranges, including leaks of 10l/min of CO2. General Dynamics Mission Systems launched their Bluefin-9 at Oceans 2018. Bluefin-9 is a two-man portable AUV which comes equipped with Solstice as standard. Each side-scan modality has its strengths and weaknesses. For man-portable AUVs, MAS is the best choice, fitting well within the SWAP budget of the smaller platforms. SAS is a good alternative for large AUVs, but require additional logistics, larger vessels and crews to operate. They are also not easily deployed in very shallow waters. Solstice mounted on the Saab Double Eagle.